OB/GYN medical malpractice occurs when an obstetrician or gynecological staff member does not provide the minimum accepted standard of care. Gynecological or obstetrical negligence can endanger lives, impact a woman’s fertility, and cause serious health conditions for a mother or baby. Hospitals and other obstetrical care clinics are responsible for upholding the standard of care and overseeing their staff’s compliance with safety protocols. In addition, they should establish an environment in which gynecological healthcare providers are encouraged to report errors. A negligent reaction or failure to react to a medical error can worsen an existing condition or cause additional complications. A physician’s negligent acts during prenatal or postnatal care can lead to permanent injury or other damages to a mother or infant. OB/GYNS trail neurosurgeons with the second highest number of medical malpractice claims. Research shows that 70 to 85 percent of obstetricians have been sued at least once for medical negligence. If you or a woman in your family has suffered a significant injury as a result of a physician’s mistake during prenatal care, perinatal care, or gynecological treatment, the advice of an experienced medical malpractice lawyer can help. To learn whether you have a chance to recover damages for OB/GYN malpractice, contact Miller & Wagner in Portland for a free consultation. 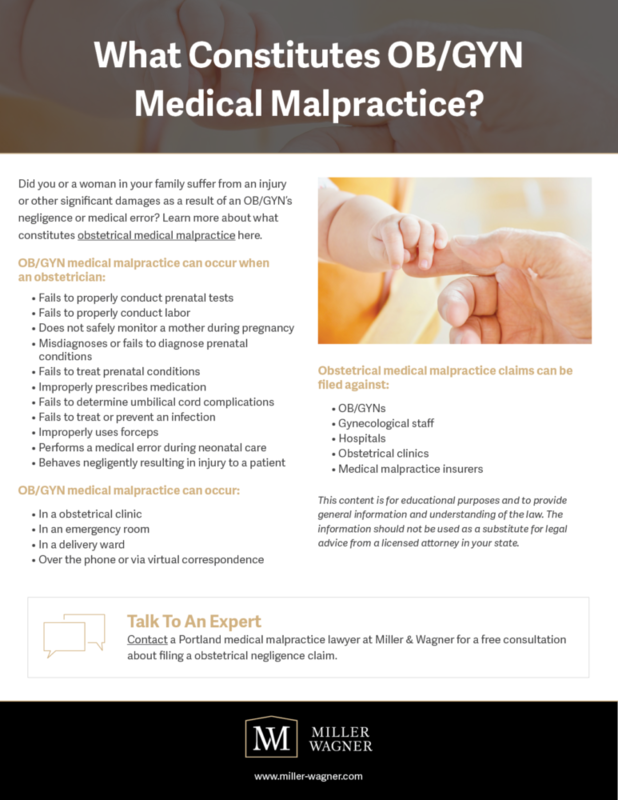 Similar to other medical malpractice cases, negligence claims against OB/GYNs need the support of doctors who can provide qualified and credible opinions about the specific mistakes that injured the patient. We have access to an outstanding network of physicians who can review the facts of your situation and identify the signs of negligence. Did you know receiving adequate care can depend on where you live? Over 28 million American women of reproductive age live in rural counties, and nearly half of U.S. counties do not have a practicing OB/GYN. This shortage in specialized gynecological healthcare may contribute to an increased number of medical malpractice cases. We represent women across the Portland metro and Vancouver area who have suffered severe injuries through substandard medical care during high-risk pregnancy, childbirth, or obstetrical surgery. The OB/GYN medical malpractice attorneys at Miller & Wagner have extensive experience handling legal claims filed on behalf of women who were injured under obstetrics and gynecological care. Our excellent reputation among Oregon physicians means many of our law firm’s medical malpractice referrals come from doctors who suspect malpractice on the part of a physician who treated a member of their family. Plaintiffs in obstetrical medical malpractice cases may be entitled to compensation for pain and suffering, medical bills, lost wages, or wrongful death. If we determine medical malpractice was responsible for serious damages incurred by you or a family member, Miller & Wagner will present your damages claim with thorough documentation of every aspect of your injuries and losses. Contact us today for a free initial consultation.